This article discusses the benefits of VA loans and the important support provided for veterans purchasing a home in Central Florida. Is unlikely to pose a problem for the VA appraisal process. The Department of Veterans’ Affairs established the VA loan program 1944. VA loans have provided loans for more than 21 million loans for veterans, active-duty military members, and their spouses since their inception, making buying a home more accessible to veterans, those who most deserve the American dream they helped build and continue to protect. You do not need a VA Certificate of Eligibility to begin looking for a home. In fact, you do not even need to know if you are eligible for a VA loan, as your agent will put you in touch with a lender who will find out if you are qualified and obtain this critical document for you using an automated government system. Additionally, some spouses of military members who died of a service-related disability or while in the line of duty also may qualify for a VA loan. To do so, the veteran can assign a power of attorney to a spouse or family member to manage the loan process and sign the necessary documents. You will need one of two types of powers of attorney, either general or specific, depending upon what types of loan-related documents must be signed. The options for occupancy and power of attorney help provide eligibility to a VA buyer’s spouse and children, allowing the purchase of a home during an unaccompanied assignment or deployment, alleviating the emotional toll of multiple moves for a military family. BAH can change annually. You can calculate your housing allowance with the BAH calculator on the Defense Department’s website. Lenient Credit Requirements for a VA Mortgage VA loans accept lower credit scores than do conventional loans and FHA financing. No minimum credit score is required for obtaining a VA mortgage. However, borrowers must show they have sufficient income to repay the loan. Although they should not have excessive debt, the loan guidelines are usually more flexible than for conventional loans. Therefore, qualifying for a VA loan is easier than other financing options. Down Payment on a VA Mortgage VA home loans require zero down in Central Florida. Instead of a down payment, those qualifying for a VA mortgage must pay a funding fee. This fee covers the risks associated with financing the same as would a down payment. However, the funding fee can be included in the loan amount instead of needing to be paid up front, making it easier for a veteran to afford a home. The funding fee is usually 1.25 to 2.7% of the total cost of the home purchased. Longer Loan Amortization Period on VA Mortgage The repayment period can be much longer when compared to traditional mortgages. Lower Average Interest Rates on VA Mortgages VA loans provide fixed interest rates that are competitive with conventional mortgages. 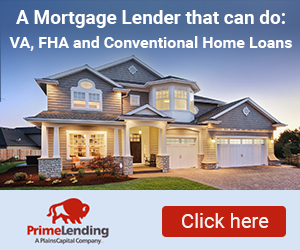 No Mortgage Insurance Required on VA Mortgages Conventional mortgages that do not have the required 20% down payment often require the borrower to get mortgage insurance. With a VA loan this is not a requirement. A team of experts with the VA will work with you if you are struggling meeting your financial obligations to find an alternative to foreclosure, such as negotiating repayment plan or loan modifications. Nearly 500,000 veterans and active service members have been help to avoid foreclosure over the past six years. Financial protection involving interest rates, income tax payments, eviction, foreclosure, and more is provided to military members and their families by the Servicemembers Civil Relief Act (SCRA). SCRA covers all Active Duty service members, reservists, and members of the National Guard while they are on active duty. The protection begins on the date of entering active duty and generally terminates within 30 to 90 days after the date of discharge from active duty. An example of this protection is the ability of military personnel to ask their mortgage lender to place a cap on their interest rate during their term of service. The SCRA also forces lenders to seek a court order before foreclosing on active-duty military members during their time of service and up to nine months after. The state of Florida provides many veteran benefits, making it an attractive place for veterans to purchase a home. The support Florida provides for the veteran population is one of the main reasons so many veterans choose Central Florida as their home. Basic Property Tax Exemptions If a veteran resident has a VA certified service-connected disability of 10% or greater, he or she is eligible for $5,000 property tax exemption. Documentation of the disability must be established with the county tax official. Also entitled to this exemption is the un-remarried surviving spouse of a deceased disabled ex-service who was married to the deceased ex-service member for at least 5 years. Homestead Exemption If real estate is owned and used as a homestead by a veteran who was honorably discharged and has been certified as having a service-connected, permanent, and total disability they will be exempt from taxation if the veteran is a permanent resident of Florida and has legal title to the property. This benefit extends to the surviving spouse as well, until remarriage or disposal of the property Florida gives preference in both employment and retention in government positions to veterans. Spouses, and widows or widowers may also be given preference under certain circumstances. Tuition waiver and deferment is given to undergraduate-level students at community colleges and state universities for Florida veteran residents who received the Purple Heart and other combat-related decorations. Tuition deferment is allowed in Florida for veterans – one tuition deferment each academic year and an additional deferment when and if a delay in benefits occurs. Reduced tuition for active members of the Florida National Guard – one-half of tuition and fees. Honorably discharged veterans receive a 25% discount for an annual pass to all state parks. A free lifetime pass is given to veterans with service-connected disabilities and their spouses or surviving spouses. Remember that a VA loan is not a one-time benefit, but can be used more than once. If you currently own a home in Central Florida, and are considering buying a newer home that meets your lifestyle. As Veteran you can use a VA loan to do so. There are many homes in communities convenient to Ocala and Central Florida. Even if you have lost a home with a VA loan to foreclosure, you may be able to buy again, as well. We hope you have found our veterans’ guide to homeownership in Central Florida useful. VA home loans have helped thousands of veterans and their families buy homes. The zero down VA mortgage, low closing costs, and relative ease of obtaining financing, all pave the way for finding the home of their dreams. Florida has advantages for veterans as the state appreciates and honors their service. Frederick Franks is an example of this desire to assist you in finding your home. Remember that until the end of the year, Franks is offering both a free appraisal and $500 credit towards closing costs. Contact him today at 1-800-253-1139, and make your dream of owning a home in Central Florida a reality.